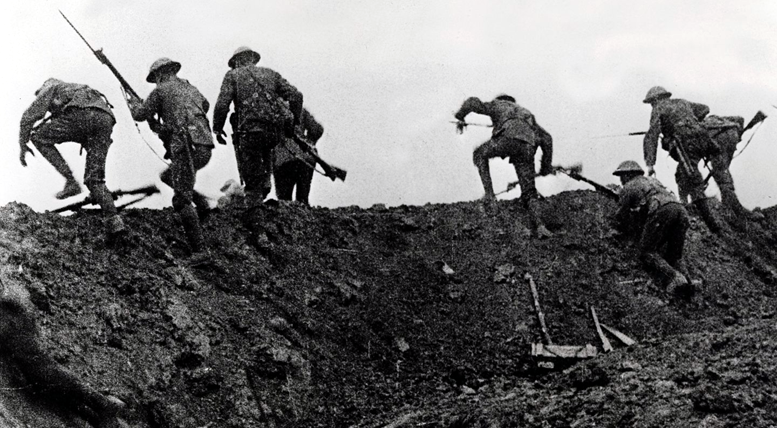 On 1 July 1916 the Battle of the Somme began with the expectation of bringing the First World War to an end. It became a huge military engagement with over three million men engaged in battle throughout the summer, autumn and winter of 1916. The plan for the Somme was first drafted in February by joint British and French forces with the objective to pierce the German front line and allow two cavalry divisions to push through. On 24 June 1916, 1,537 artillery opened fire on German lines on a 24 kilometre front and the bombardment lasted 7 days. The idea of the bombardment was to destroy German troops on the front line to allow allied troops a safe passage into enemy trenches. At 7.30am on 1 July 100,000 soldiers emerged from a stretch of trenches to walk across No Man’s land that became known as ‘going over the top’. In the daylight of a midsummer morning the troops walked in straight lines with 90 meters between each assault wave. As they made their way towards the German front line they were met with machine-gun fire, shells and grenades, the week-long bombardment didn’t weaken German defences as it was believed. Within hours over 60,000 soldiers were injured and 20,000 soldiers killed. Those who survived the first attack wave recounted their experience of watching comrades getting stuck on barbwire becoming sitting ducks against machine gun fires. Other soldiers were being killed or injured by shrapnel and grenades exploding. Many of the soldiers were part of Pal Battalions, men who were friends or family and enlisted together to fight side by side which had a hard impact on communities across Ireland and Britain. With the support of other divisions the 36th (Ulster) Division of the British Army was the only division to achieve their objectives at the first German front line but due to bad communication they came under artillery bombardment from their own side. The Germans had no time to come up from their dugouts allowing the Ulster men to advance and capture the impregnable Schwaben Redoubt opposite Thiepval Wood. To continue their advancement behind German lines they needed fresh reinforcements and word was sent if the 107th brigade should advance. HQ ordered a halt to the advance but as telephone lines were severed the order received was too late to stop troops from going over the top. The 36th held onto the German front line fending off counter attacks from the Germans but by nightfall nearly all officers were injured, ammunition was low and no reinforcements arrived. Having to abandon the positions they had and return to their starting position their losses became clear. 5,500 officers and enlisted men killed, wounded or missing. They soldiers of the 36th (Ulster) Division were awarded 4 Victoria Crosses for their bravery that day and are remembered today with memorials, murals, and commemorations. The 29th Division made an attempt to capture a strong-point at Beaumont Hamel, a sector neighbouring that of the 36th (Ulster) Division. A tunnel of explosions was dug under Hawthorn Redoubt but the decision to fire the explosives at 7:20am gave the Germans warning of an incoming attack which allowed them to occupy positions around the crater caused by the explosion. The 2nd Royal Dublin Fusiliers made up of 503 men went as part of the second wave in the attack, 325 of its men became casualties. The 1st Royal Irish Fusiliers were able to capture a position known as the as the Quadrilateral but had to withdraw due to their isolated positions. Along with the 8th Division the 1st Royal Irish Rifles crossed No Man’s Land in the second wave but couldn’t go any further after its Commanding Offer was killed. Near the village of Mametz the 2nd Royal Irish Regiment of the 7th Division helped to capture three miles of the German frontline trenches. The 2nd Royal Inniskillings Fusilers were in the 32nd Division suffered 4,000 casualties after being repulsed at Thiepval village allowing the Germans to concentrate their fire on the 36th (Ulster) Division and force them to withdraw. The Tyneside Irish Brigade had 3,000 men who advanced over one mile of open ground before reaching the front line. As part of the second wave they crossed 500 yards of No Man’s Land and continued until only 50 soldiers were left in the German trenches. Their efforts cost 2,139 casualties, 620 of whom were in the 1st Battalion. The casualty list recorded by the British for 1st of July was 57,470 soldiers killed, wounded, missing or taken prisoner which is approximately half of those who went into battle. Losses on the German side were estimated to be 8,000. Ireland’s Unknown Soldiers: the (Irish) Division in the Great War, by Terence Denman. Irish Regiments in the Great War: Discipline and Morale, by Timothy Bowman. The Irish on the Somme, by Steven Moore. The First Day on the Somme, by Martin Middlebrook. The Road to the Somme. Men of the Ulster Division tell their story, by Philip Orr.